So I finally had a go at mapping out my online documentary. Currently I am tossing up between two different structures. They are described and wireframed below. The first is based around the five different types of fear. Users first answer a multiple choice question (what do you fear most?) with the answer corresponding to a different section of the site. Users can then go up or down in the hierarchy of fears (ego death is top, extinction is bottom) or head to a home screen where they can navigate to any one of the other pages. I like this structure because it is simple and would allow me to strongly theme each page. It is basic, but would ensure easy navigation. 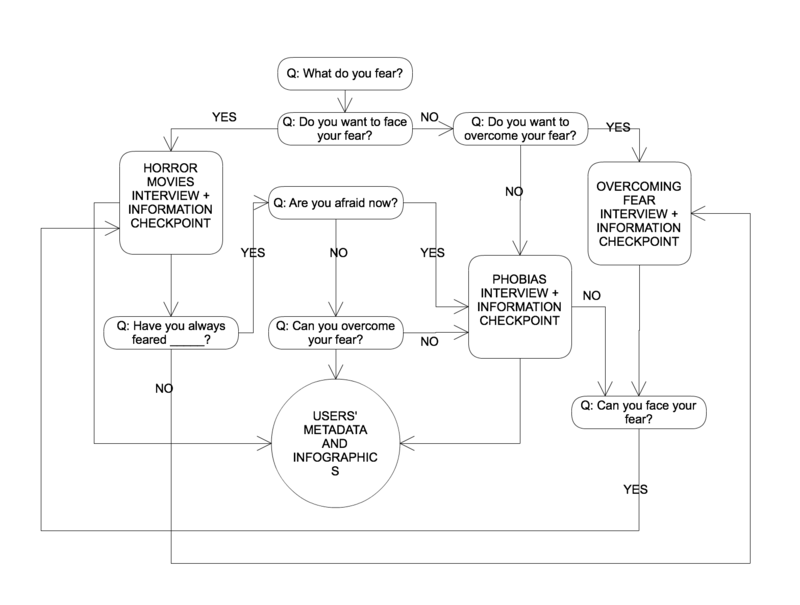 The second idea strongly utilized the ‘questions about fear’ idea I had earlier. Users answer a number of yes or no questions, their response guiding them to different collections of information. Whilst this form may cause frustration as it is a little ambiguous to navigate, it really aligns with my vision for an ‘immersive’ experience. It’s like you are letting your own fear guide your exploration of the content.